Mix the crumbs, nuts, and melted butter together in a small mixing bowl. Press into the bottom of a 12 ½ by 17 ½” jellyroll pan to form the crust. Preheat the oven to 300°F. Place a shallow pan of water in the oven on the bottom shelf, leaving the middle shelf for the cheesecake. Put the softened cream cheese in a mixer, and using a paddle, beat until smooth. Add the sugar and continue beating until the sugar is dissolved and the batter smooth. Be sure to scrape down the mixture well, or you will end up with lumps in the batter. Then add the lime juice, zest, mascarpone, vanilla, and flour. Blend well and again scrape the mixture down. Add the eggs, mix well. Then add the sour cream. Pour the batter into the prepared pan, and place in the oven. Bake about 15-20 minutes, until the cheesecake is set when jiggled. 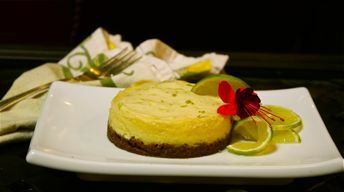 Remove from the oven and spread with the key lime mixture, return to the oven and bake for 5 minutes. Remove from the oven, cool for 15 minutes, and then refrigerate until serving.